Telluride is considered one of Colorado’s best ski resorts and one of the best in the country—and for good reason. Telluride sees more than 300 inches of snow a year and 300 days of sunshine to match (yes, even when it’s snowy). And the mountain is high: the base is 12,570 feet and peaking at 13,150 feet above sea level. Perhaps the resort's best feature? Unlike many other world-renowned ski resorts, Telluride doesn’t have long lift lines, thanks to its remote location. Telluride is about 200 miles (a more than six-hour drive) southwest of Denver. If you want to save time, book a flight from Denver to the Montrose Regional Airport; the small regional airport is just 65 miles from the resort town. Seasonal, direct flights to Montrose are also available from major hubs, including Atlanta, Dallas, Chicago, New York, San Francisco, and Los Angeles. The small, eight-by-12 block town itself is an adorable, European-style village set in a canyon of tall mountain peaks. Although it's most well-known as a winter destination, music and food festivals draw visitors in the warmer months. Much of Telluride is a National Historic Landmark District because of its 19th-century mining history; take note of the well-preserved Victorian homes and storefronts. The smaller, nearby town of Mountain Village provides access to the ski resort and national forest. A free, 13-minute gondola ride connects the two towns. More than 2,000 skiable acres and 4,425-foot vertical drop: 23 percent beginner, 36 percent intermediate, 41 percent expert/advanced. Telluride offers terrain for all levels. Advanced: Head to Lift 9 and try Plunge, with steep runs and bumps—what Telluride is known for. The Plunge, a black diamond, provides great views of town. Lift 14 provides access to Gold Hill's steep mountain faces and above-timberline skiing. Intermediate: For moderate bumps and glades great for intermediate skiers and boarders, Village, Prospect, and Palmyra are favorites. But See Forever is the most popular trail, due to its sweeping views. Beginner: Newbies can practice their skills on Galloping Goose, Ute Park, and Prospect Bowl. These are some fun green and blue runs to learn and improve on. Telluride has a charming downtown and many great places to eat and celebrate. Here are a few highlights. Gorrono Ranch: We love on-mountain dining options, and Gorrono Ranch delivers. Fuel up on burgers and salads at this cafeteria-style spot in Mountain Village, off the Misty Maiden Ski Run. On sunny days, grab a spot on the deck by the fire pit and listen to live music while you dine—in full ski gear, if you want. New Sheridan Bar: For some of Colorado's best apres ski sessions and nightlife, check out the lively New Sheridan’s Historic Bar in Telluride. It’s one of the oldest bars in the West and much of the decor nods to that legacy. Enjoy drink specials, listen to live music, play pool, and warm up. If the weather’s nice, this bar offers panoramic rooftop seating. Allred's Restaurant: If you only splurge on one fancy dinner in Telluride, make it Allred's. Dine more than 10,000 feet above sea level on the top of the gondola overlooking Telluride. Allred's serves up spectacular views, plus an award-winning wine list, hand-crafted cocktails, and fine contemporary American dining. Menu items include lobster bisque soup, wagyu beef carpaccio, and a Colorado rack of lamb served with carrot puree, confit-rosemary marble potatoes, almond emulsion, and jus. Chop House Restaurant: This is Telluride's classic steakhouse, with a great wine list (and a nitrogen wine bar). It's located inside the New Sheridan Hotel. Cosmopolitan: Come here for hearty chops and seafood; classic cocktails; and fresh sushi and sashimi. Cosmopolitan serves 100 percent Japanese wagyu beef, which has a high-fat content that just melts in your mouth. The restaurant carries wagyu beef from two different area ranches. A highlight is the 18-ounce 7X Wagyu (that's the ranch's name) New York strip, big enough to share. It's served with mashed potatoes, mushrooms, Brussels sprouts, and a red wine jus. Tacos Del Gnar: If you want tasty bites on a budget, Tacos Del Gnar is the place. This self-proclaimed progressive taco shop serves up hand-squeezed margs and hearty eats in a laid-back and quirky setting. Every taco on the menu is drool-worthy. There are multiple places to rent your ski gear on the mountain and in town. Two of the largest outfitters are Bootdoctors and Paragon Outdoors (family-owned in both Telluride and Mountain Village) and Telluride Sports (the area’s biggest chain, affiliated with RentSkis.com; it also has locations in both Telluride and Mountain Village). You can also save money and time by reserving your gear online at rentskis.com. Pick your stuff up slopeside or even order it to be delivered to your hotel room. Telluride offers a variety of types of ski and snowboard lessons, including private lessons, children’s classes, adult group classes, specialty camps, and an adaptive program. There’s a special first-time skiers guide, too. Within the category of adult group classes are a variety of styles of lessons. The Morning Max 4 is a morning class that starts at 9 a.m. for intermediate and advanced skiers and boarders. Per the name, these classes cap at four students so you get plenty of individual attention. For beginners, there's the Never Ever Beginner class, which runs every day. For advanced skiers, there are the Mountain Adventure lessons. Take a ride on the free gondola between Telluride and Mountain Village and enjoy the views. Bring your camera and get some stunning shots to print when you return home. Visit the Telluride Adventure Center for a variety of exciting backcountry adventures in the San Juan Mountains. Options include snowshoeing, ice climbing, snowmobiling, Cat skiing, heli-skiing, and even a bungee trampoline. Snowshoeing is a particularly fun way to enjoy the Colorado snow without having to put on ski boots. Climb up a frozen waterfall in Bear Creek or Bridal Veil Falls, the tallest free-falling waterfall in the state. You'll have a guide there to help you, so don't be intimidated and check something new and wild off your travel bucket list. Ski above treeline with the Telluride Helitrax Eurocopter, a helicopter that will bring you to high terrain for extreme adventures. This is a new kind of experience on skis. Relax in the spa. The luxurious Madeline Hotel offers a spa with treatments designed to help you recover quickly after a day of skiing. The spa also offers yoga and Pilates classes (more than 20 per week) to help bring your body and mind into balance. Menu items include hot stone massage, warm oil treatments, facials, hand and foot therapy, manicures and pedicures and even hair treatments, blow-outs, and cuts. If the altitude is getting to you, visit the Altitude Adjustment Oxygen Bar. Other fun treatments include a couples aromatherapy massage and in-room bath. It's the perfect way to relax, whether you are recovering from the mountain, the cold air or just from travel. Telluride has more than a half-dozen art galleries that you can browse, including the Telluride Gallery of Fine Art, the oldest gallery in the area. This gallery features well-known and regional sculptors, painters, photographers, and jewelry. Browse and look for a one-of-a-kind souvenir from Telluride. Telluride is also home for some of Colorado's greatest festivals. There always seems to be a cool festival in town, from music to comedy to food. Check Telluride's events calendar for the latest things to do. Lumiere Hotel: Stay here for luxury in a boutique-style resort with ski-in/ski-out access to the mountain. Lumiere Hotel has a variety of styles of rooms to pick from, including high-end, five-bedroom residences. The hotel also has a pool, hot tub and sauna to relax in after a day on the mountain. To simplify your skiing experience, the hotel offers a ski valet and equipment rentals on site. Madeline Hotel and Residences: Stay at Telluride's only Four Diamond, full-service hotel right in the heart of Mountain Village. This luxury resort offers ski-in/ski-out access, a full-service ski valet, a spa and more. 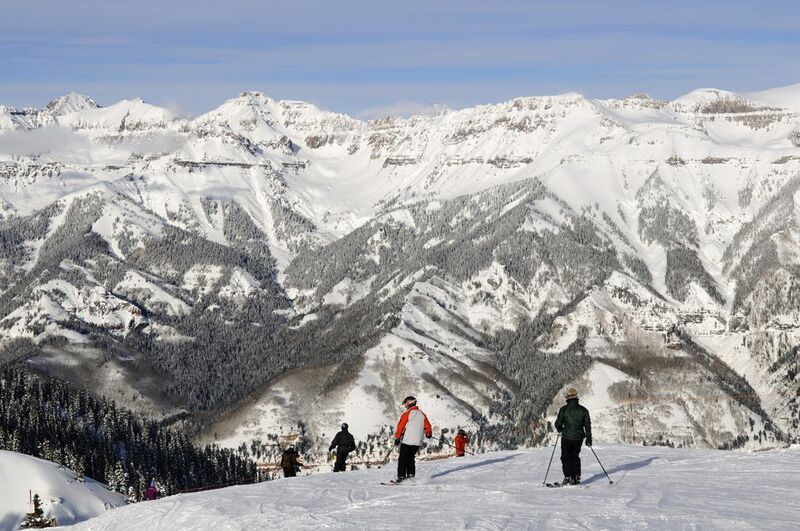 Guests even can earn two free lift tickets to Telluride. This hotel was named among the Top 10 Hotels in the West by Conde Nast Traveler readers. The Peaks Resort and Spa: The ski-in/ski-out resort just 10 minutes via gondola from Telluride is perched at 9,500 feet above sea level surrounded by the mountains. In the summer, it also offers golf access. The Peaks has an on-site, full-service spa and salon, plus a fitness center, fitness classes, a pool (with an indoor waterslide), Roman tubs, hot tubs, saunas and more.